As you probably have already guessed, we live in Russia, work in Russia, and make this site in Russia. In a small and nice place Pskov. This is why all articles of this site have an evident Russian coloring, and the history of this site begins with internet projects in Russian. Everything began with a weekly mailing list “Chaynik” (“teapot”). It was launched on 1 November, 1999. 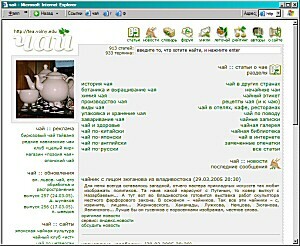 Later (on 30 December, 2000) the first version of Russian site “Tea” appeared on the net. 11 September, 2002  the second version. 12 March 2004  the third version, which is still working at http://tea.volny.edu. This site is very big, maybe, even the biggest tea site in the (there are more than 900 articles alone)  but it is in Russian. We do not know for sure why we decided to make an English site. Of course, we want to get acquainted with new people and get new information on tea. We certainly want to share our own knowledge, observation, and experience. We undoubtedly want to attain world fame for 125 years. Finally, it is very interesting  to make a site on tea. Even if it is in English. This site will not be as big as its Russian forefather, but we hope, that it will just as interesting. We will be happy to receive any criticism and corrections. We will answer any questions with pleasure. We will gratefully accept any advice. Mail us or join our discussions. Denis Shumakov, Olga Nikandrova, Denis Lesin, Sergey Kalinin.